I think the beauty of my recent four day flip to Jacksonville was the vast number of day trips in, and around northern Florida that are unto themselves a destination. So far, on my trip I’ve explored Savannah, and along the Jacksonville beach neighborhood. My third day started off with a great little brekkie place and even closer to the hotel than my recommendation from last week. Yep, the Metro Diner (1534 3rd St N, Jacksonville Beach) is just a couple of hundred meters from the hotel and opens early (6:30 am), and clearly has a loyal and steady patronage. I had the Protein breakfast (4 eggs, bacon, link sausage and fresh baked biscuit), with a few cups of delicious coffee to wash it all down! I love little diners like this! Who knew there were so many interesting people to watch…with the regulars, the locals and the eclectic mix of out of towners (of which I was one)…it truly was a slice of life! The destination and adventure was just 40 minutes south of Jacksonville beach…St Augustine. As you’d expect my drive was somewhat typical for Florida in that half the journey was along a busy road with an endless series of shops and so I was pleasantly surprised when the strip malls ended and a lovely costal drive began. The road wove its way through wild Tea Tree, sand dunes and beachside houses all dispersed along the coast. As you’d expect I learned a few things about St Augustine even before my day of exploration. Here are a few fun facts – its the oldest European settlement in the United States. In fact, St Augustine was first settled by Pedro Menéndez’s on behalf of Spain’s King Phillip II in 1565. The King of Spain bequeathing Pedro the rights to exploit and plunder the riches of the territory which he had christened “La Florida” on his behalf and then ordered him to ship whatever he found of value back to his coffers in Spain…el pronto! It was a dark time for the indigenous locals who lived adjacent to the new settlement, because along with the epidemics and pillaging of local food stocks they also brought death and destruction in the form of muskets and swords to quell any form of unrest. Certainly not the quiet neighbors you’d hoped for…right? What struck me about this proud and noble little town was the architecture. Given the size of the town it punches way above its weigh in that department. 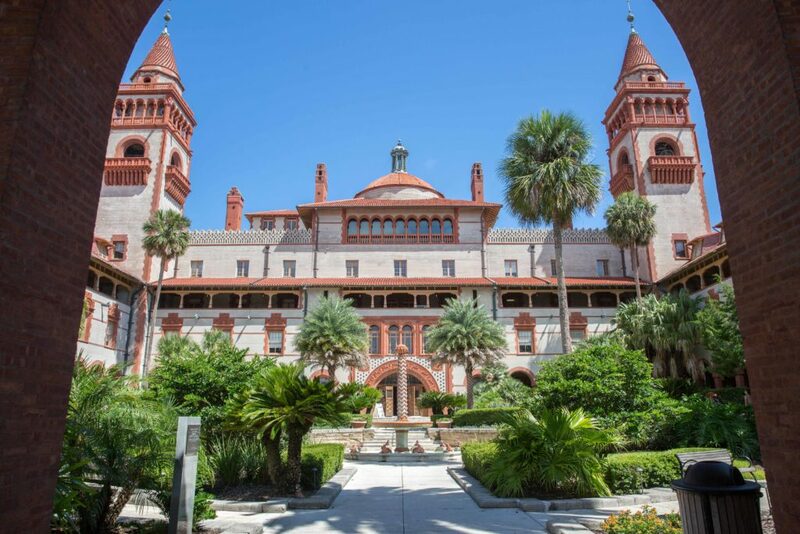 In the center of town are three stunning examples of Spanish Renaissance Revival architecture, the first is the Alcazar Hotel, now the Lightner Museum. The hotel was initially commissioned by Henry Flagler in 1887 who, as the owner of the Florida East Coast railway lured the wealthy tourists from the north and north east who flocked to Florida to escape the long cold winters exclusively on his regularly scheduled trains…smart man! Flagler who had decided that St Augustine was just the place to secure his already sizeable wealth (he was also co-ower of Standard Oil) by constructing the Ponce de Leon hotel (now Flagler College) adjacent to the Alcazar. Both buildings were designed by the famous New York architectural firm of Carrère and Hastings. The third and final grand hotel in this triumvirate is the Casa Monica. Surprisingly this is the only one of the three hotels still in operation today and is often referred to as one of the most romantic hotels in the United States.The design and architecture of this beauty is completely different than that of the Alcazar or the Ponce, but still very European in nature. The story goes that when the original owner of the Casa ran into financial difficulties in 1902, Flagler swooped into to purchase the hotel thus taking ownership of the final grand hotel and thus securing a monopoly on the hotel business. As owner he also decided to rename it the “Cordova” to keep with the towns Spanish lineage, all ran smoothly until 1929 when the Great Depression struck with all its mite thus ending the flow of tourists. At this point Flagler decided to turn the Alcazar into his personal museum and bestowed many of the artifacts that you see today in the Lightner. The downtown core of St Augustine is made up of these three grand hotels along with the old settlement area (although a tad too touristy for me personally). Included in this historic part of town is the beautifully restored Cathedral Basilica of St Augustine (the oldest church in the United States) and the Castillo de San Marcos constructed in 1672 which is the oldest masonry fort in the continental United States. By early afternoon I was feeling a little peckish and decided to drop into the Milagro on 12 Latin Kitchen (3601, 12 Avenida Menendez, St Augustine,) for a light lunch. The food was authentic and tasty and I’d highly recommend giving it a try…so delicious! Seriously what’s not to like with its endless beaches, great weather and fabulous places to see and explore up and down the coast, its well worth a visit!. 0 Comments on "Early discovery"